Meet Cesar Antonio Diez Pachas. 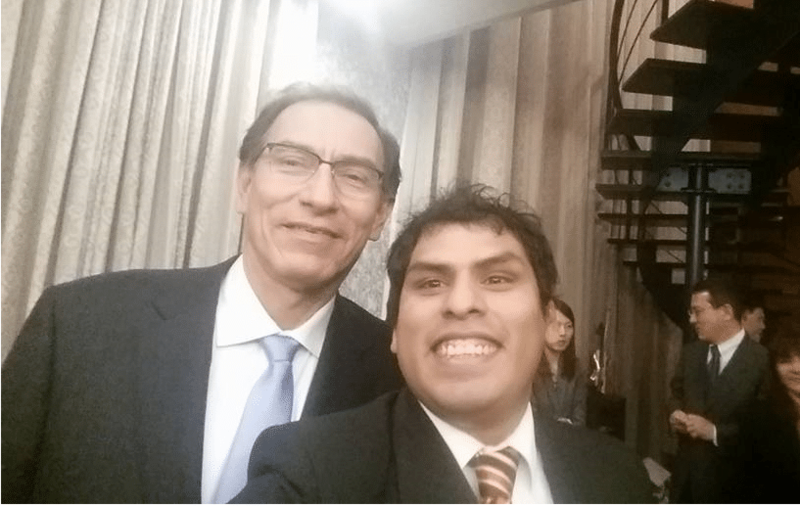 Cesar Antonio Diez Pachas is the second Peruvian to receive the MEXT scholarship for the undergraduate program and the first one to receive the scholarship from the Nitori International Scholarship Foundation. Cesar completed his studies at Kobe University and then worked for NTT Communications. 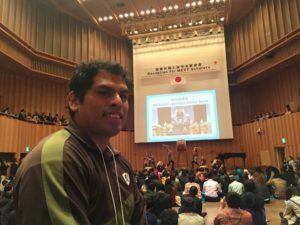 In an effort to help Peruvian scholars coming to Japan, he founded the Association of Peruvian Students and Graduates in Japan: APEJA. After working at Rakuten in Tokyo, he is currently working for the Advertisement Business of Rakuten Asia (Singapore). I: How and when did you find out about the scholarship? C: I was in my second year at a university in Peru. My sister found about the scholarship through a Peruvian website (Universia). She told me about it and suggested that we both apply for it and I thought “why not?”, so we did. I passed but unfortunately my sister didn’t. I also passed the interviews and I remember we were 3 people in total at this stage of the process. I think one of the reasons why I got the scholarship was that I entered university when I was 15 years old so I was 17 at this point with 2 years in a university. Also, I think that one thing that motivated me to apply when I was 17 years old for the scholarship was that I wanted to be more independent. I would live by my own for 5 years without having to depend on my family thanks to this Scholarship. I never thought about studying in Japan until that moment, because my former plan was to finish my degree quickly and then apply for a master scholarship in Spain, so it was unexpected. I: So this wasn’t your first option when deciding where to get your degree. C: No, it wasn’t. I was already studying in Peru when I applied for the scholarship. I: Were you studying the same major as you did in Japan or did you change majors? C: It was a time of changes for me. I was studying mechanical engineering in Peru, but I was also interested in informatics, so I decided to apply for that major. My plan at that moment was to complete the 5 years in Japan and then go back to Peru and complete my degree in mechanical engineering, but I ended up staying in Japan for more than 12 years. I: What do you remember the most about the application process? C: The interview. It was the first time in my life that I had to go through an interview and I was very nervous. I remembered the questions I was asked, things like “how do you see yourself in 10 years?” “how do you think you could contribute to your country?”. It made me think a lot about my future, and I think this was very useful because I got asked similar things when I applied for a job in Japan. I think it is very interesting to be asked such serious questions when you are 17. I: What was your reaction when you were notified you’ve got the scholarship? How and when was it? In my case, they called me. I was on my way to the university I was studying at that moment and I got a phone call and a woman told me in a very monotone voice that I had received the scholarship and I remember thanking her and hanging out. And then I realized what was actually happening and couldn’t believe it. How was it for you? What was your reaction? C: There were 6 months between the interview and the time I got the response and I remember being anxious during that time. I was told at the beginning of January also through a phone call. I remembered being extremely happy about it. My flight was in April, so I took Japanese lessons for about 2 months. I tried to do things that I hadn’t done before then: go out with friends, go to parties, play sports, etc. I: So, you took Japanese lessons as a way to prepare for your life in Japan. Is there any other thing that you did to prepare yourself for Japan or for living alone for the first time? C: Coincidentally enough, those 2 months I sort of lived by my own because my mother was visiting my aunt almost everyday, my sister went on a working holiday and my father wasn’t around the house much, so I think it was a good way to prepare since I had to do most things by myself. I: You spent your first year in Japan in Osaka, how was that experience? C: Yes, I was in Osaka from 2005 to 2006. We were about 70 students there, I am not sure about the numbers for those in Tokyo. 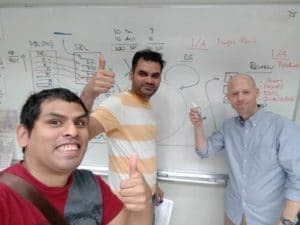 I think one of the best things about going to Osaka during the first year is that the campus is isolated so you have a lot of time to concentrate on your studies and to socialize with the other scholars. I made good friends there. I met my best friend there (he is from New Zealand and his room was next to mine). One thing that I like about the scholarship is the friends that I made during that first year: you meet people from all over the world with a different background than yours but you are all sharing a similar story in that moment: you live together, you study together, you eat together. It felt like being brothers. It’s been over 10 years but I am still friends with people I met during my year at Osaka. We meet a couple times a year. I have visited their countries, met their families, went to their weddings. I met people from countries I didn’t even know existed. You realized that the world is huge, that there are so many places that you didn’t know about. One of the first countries I visited with my friends was Singapore. I didn’t imagine that I would live there some years later. I: What did you do after completing the scholarship’s 5 years? How did you make this decision? C: I couldn’t extend the scholarship: that year (2010) was the year when MEXT changed the GPA requirement (from 2 to 2.5), many of my friends were on the same situation. I looked for other scholarships but most of them are for people from Asia. There were very few, virtually none, scholarships available for Latin Americans. So, I had to apply for that kind of not-very-known scholarships. I applied for 2 scholarships: one was from Hyogo prefecture and the other one was the Nitori scholarship. I got both and opted to go with the one from Nitori. I found out about this scholarship through my best friend and he was the one who motivated me to stay in Japan because I wasn’t sure. As I said, there are very few scholarships available for Latin Americans. This was one of the reasons why I decided to support and found APEJA with other Peruvian students and alumni: to share information about these opportunities. I also got help with housing from a different foundation. If it wasn’t for this, I wouldn’t have been able to stay in Japan. I: What are the requirements for the Nitori scholarship? How is the application process? C: It is very similar to MEXT: document screening and multiple interviews. On the last interview, they ask about your research plan. I already had my thesis in Japanese at that moment, and that really helped. I think that they were looking for more diversity at that moment: the scholarship is for both Japanese and foreigners, but most recipients were Chinese so they wanted people from other countries and I think I was a good fit. I: You worked for a Japanese company after completing your studies. How did you decide to work for that company? How was the process? C: Right, I worked for NTT Communications. The application process was very hard for me: I was working part-time at a convenience store from 10 pm to 8 am. I was also teaching English. There were days where I finished working at 8am, went home, took a shower and left around 9am to go take exams or interviews, without sleeping. I got offers from both Nitori for Kansai and NTT Communications for Tokyo. NTT was closer to my major, so I chose it. NTT gave me the opportunity to live in Tokyo and do my training in Sendai. I: How long did you work for NTT? C: 5 years. It was a good opportunity to learn about pre-sales, disaster recovery, servers, cloud, data center, etc. I: As anything in life, I imagine it had its good side and its bad side. What was the best part about that experience in NTT? Is there anything you didn’t like about it? C: I think the biggest lesson I learned there was the way of working in Japan: how to write emails, how to behave (business manners). I also learned how to work in projects with other teams, time management, etc. I: After NTT, you changed jobs to Rakuten. How did this happen? What are some of the differences between these 2 companies? C: During my first 3 years at NTT, I gained a lot of knowledge on the technical side of the job, but then the learning curve was not good. When I was looking for a new job, I realized what things I was looking for in a company: motivation, “feel the hunger” as they say, be part of a team that wants to accomplish something. There were 3 companies I was interested in: Nissan, Rakuten and Softbank. I had researched about these companies and I liked that they have a “strong” CEO – someone with vision. Before applying to Rakuten, I got an offer from Nissan, but I didn’t accept it because of salary and location. Then I applied to Rakuten and Softbank. I got an offer to work as a Producer (similar as a Product Manager) in Rakuten, which was a role I was interested in so I took it. I: How did you end up in Rakuten Singapore? C: I was living with my fiancée (now my wife) in Tokyo. She got a job in Singapore when I was working in Rakuten, so after working for a while in Rakuten I asked for an opportunity for transfer. I had interviews as a normal candidate and I was selected after passing the interviews. I’m very grateful for the opportunity that Rakuten gave me. That’s why I love this company. I: What are your plans for the future? C: Work-wise, I think this year I have learned a lot of things about how to manage a team. I would like to stay in Singapore a bit longer and learn new things. I got 2 certifications from Scrum.org that I’d like to use in my team. Also, I would like to travel around Asia more, and maybe work in a third country, and/or maybe go back to Japan in the future. I: How do you think we as senpais can help our MEXT kouhais? C: I met another Peruvian when I was in Osaka, he was an exchange student and became a brother-like figure to me. He helped me with all sorts of things. But he left after 6 months and it was a huge impact for me because I felt I lost a role model. I think that having someone to guide me would have helped me a lot in many aspects: the job-hunting process, how to extend the scholarship, what other scholarships are there, internships, etc. This is also one of the reasons why I decided to found APEJA: to provide help and guidance for the Peruvians coming to Japan. I: Do you have any advice for the kouhais? C: I wasn’t the best student at university but I think one good thing about me back then was that I never gave up and that I researched everything: don’t wait for things to happen, research and then go for it. I think this attitude helped me in many aspects of my life. At the same time, I would tell them to don’t stay in their comfort zone, when you feel too comfortable where you are, it means that you are not learning anything new, you need to get out of it and try new things, look for opportunities and take them. Are You A MEXT Student or Alumni? 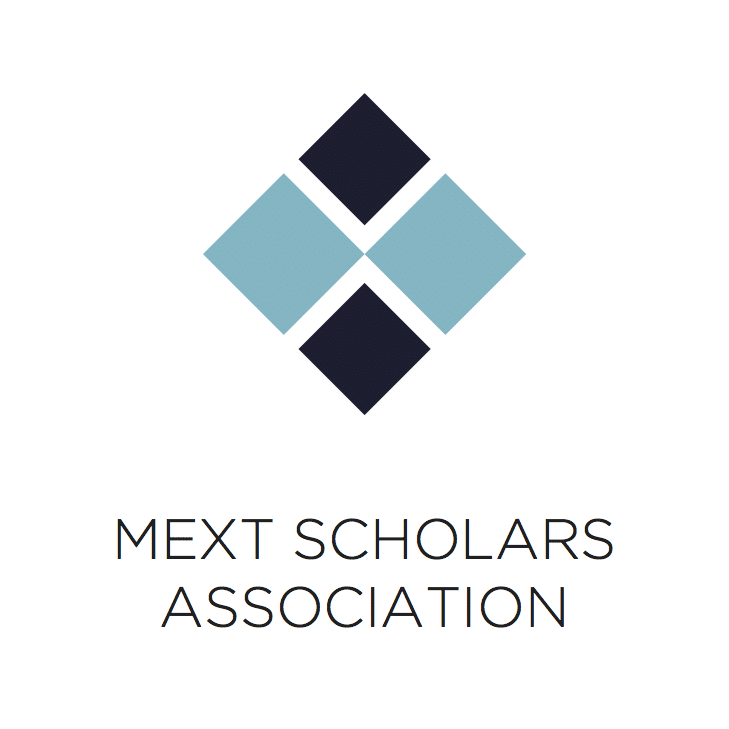 MEXT Scholars Association (MSA) is a group founded by MEXT scholars for MEXT scholars. We felt that it was a shame that there was no community between scholars - which was a shame since we hail from all parts of the world, have passed through a strict selection process and are involved in all sorts of activities. Through our activities we want to bring MEXT scholars, both current and graduated, together. We also want to contribute to Japan, to which we are indebted to, and to the wider world.